MOSCOW, August 27. /TASS/. An active powered exoskeleton with integrated electric motors and a storage battery tested in Russia will allow servicemen to accurately hit targets with a machine-gun held with one hand, Chief Designer for the Life Support System of the Soldier Combat Outfit at the TsNiiTochMash defense contractor Oleg Faustov told TASS on Monday. “We have already held trials for the prototype of the active exoskeleton. It really enhances a serviceman’s physical abilities. For example, the tester was able to shoot from a machine-gun only with one hand and accurately hit targets,” Faustov said, replying to the corresponding question. In the near future, the active exosuit will enable soldiers to carry more combat gear and armaments, move quicker and accomplish combat objectives more effectively, the chief designer said. The absence of a storage battery with the required characteristics still remains a major problem in creating the powered exoskeletons, but work on fine-tuning it is already in progress, he added. 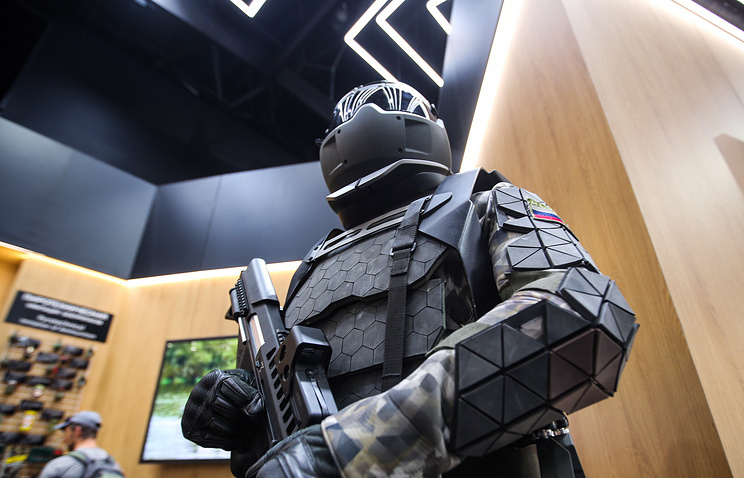 Chairman of the Russian Ground Forces’ Military and Scientific Committee Alexander Romanyuta said at the Army-2018 international military and technical forum that an active powered hardsuit would be added to the third-generation Ratnik-3 ‘Soldier of the Future’ combat outfit by 2025. It was reported earlier that the exoskeleton prototype was made of titanium. Currently, the second-generation Ratnik combat gear that is being supplied to the Russian Army uses a passive mechanical exosuit without electrical motors. Though it does not boost a serviceman’s physical abilities, it eases the locomotive load when carrying heavy items. That means that the weight is spread across the structural elements from the shoulder hanger for a backpack of up to 50 kg through a waist fixture and the exoskeleton components along the legs to the support pads in the footwear. Hey Buddy!, I found this information for you: "Russia tests ‘robocop’ power armor enabling soldiers to fire machine-guns with one hand". Here is the website link: https://russophile.org/russia-tests-robocop-power-armor-enabling-soldiers-to-fire-machine-guns-with-one-hand/. Thank you.